We are back from one of the best weeks ever! Late last year, Noah and I decided we wanted to take Emmie to Disney World one time as an only child. 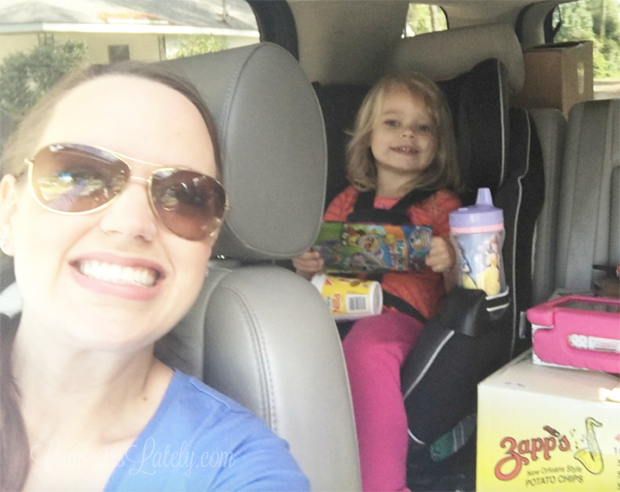 We knew we would be trying for a baby sometime this year, so we thought this was the right time to go – if I was pregnant, I wouldn’t be too far along to travel. We’ve been planning and researching like maniacs ever since – Disney planning becomes a little addictive if you’ve never done it before! It seriously is the most magical place on earth, and I couldn’t be happier with our trip. I have so, so many pictures (over 600 on my phone, not counting our Photo Pass) and things we did, so it’s just not possible to cover it all in one day. These posts are going to be split up into a few posts, and I will do one post at the end that answers any questions y’all have and tells you about the planning process (so ask any questions you have in the comments!). We left last Friday and headed to my brother and sister-in-law’s house for the night. They live in Tampa, and we haven’t had the chance to see their new home after they moved about a year ago! We stayed with them Friday night and had lunch/watched the Alabama game with them later that day. After that, we headed for Orlando for check-in! I never got a good picture of our room (bad blogger, I know), but you can see a room that is pretty much identical here. We stayed at the Caribbean Beach Resort – it’s a great, moderately-priced resort at Disney that we really enjoyed. I’ll cover that a little bit more in my wrap-up post, but just know that we loved it! After we checked in and got settled, we headed for Downtown Disney to grab dinner and get a little bit of shopping done. Rookie mistake. Just know that, if you arrive on a Saturday, Downtown Disney (now called Disney Springs) is insane. Like, shoulder-to-shoulder pretty much everywhere you go. We also made the mistake of driving instead of taking the bus. Most of the area is under construction, so it took us a really long time to get there and you have to park in the middle of nowhere if you drive yourself. We stopped by the big toy store (Once Upon a Toy) when we got there. It’s huge and has pretty much every toy you’ll see in the parks in one place. We let Emmie pick one smaller toy that night, and her Mr. Potato Head accessories. Sidenote on that – this store offers a ton of Disney-themed Mr. Potato Head parts. They charge $19.99 to fill their box as full as possible. You don’t have to buy the actual Mr. Potato Head there (we got ours off of Amazon before we left), so you can fill the box with just accessories! Emmie picked a Mermaid Tail, Buzz Lightyear shoes and belt, Mickey gloves, etc…you name it, they have it. It’s a fun little treat for the first night! 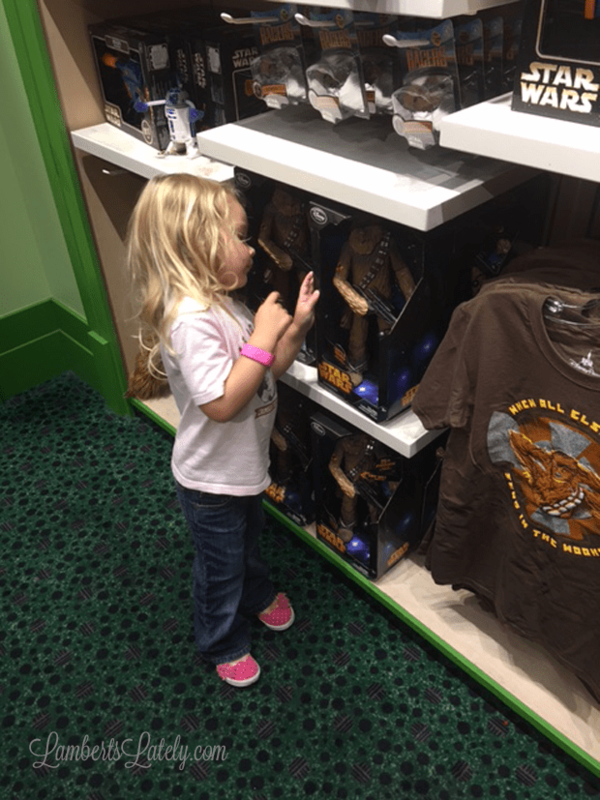 We also let her pick one smaller toy, and explained to her that this was all she would be able to buy until the last day (something I’d really recommend with small kids – there are gift shops everywhere and “the gimmes” can be rough). She got a dress-up Ariel set that she absolutely loved and played with every night. We also picked up dinner and took it back to the room. Our dining plan was in effect as of that night, so we used a couple of our quick service credits on Earl of Sandwich (the Thanksgiving sandwich, which was amazing) and Wolfgang Puck Express (the pizza, which was just ok, and the creme brûlée, which was out of this world good). I learned the hard way this night that I was going to have to take it easy. 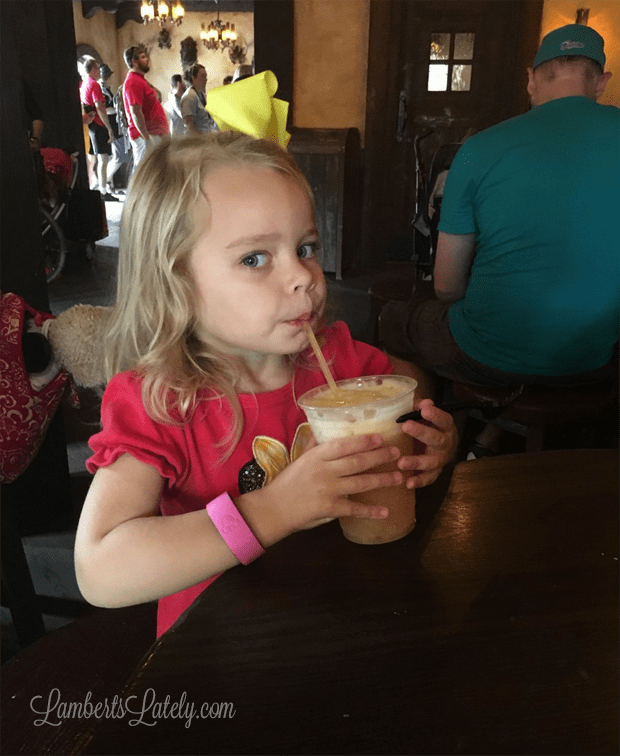 I didn’t really take a lot of breaks at Disney Springs and didn’t drink a whole lot of water, and ended up having somewhat painful contractions by the time we were leaving. They never really got into a pattern, but it was definitely enough to freak me out and teach me a lesson. Needless to say, after that I was much more careful for the rest of the week! We started day 1 of our trip bright and early Sunday morning. We didn’t have dining reservations this day, but we did have a somewhat early Fastpass. I’ll kind of address transportation in the last post, but we took the bus most of the time. This morning was one of the more crowded buses we had to use. It also took a little bit longer than expected to get there (FYI – budget 45 minutes to an hour to get anywhere on buses at Disney), so we cut it pretty close on the Fastpass! As we walked in, there was one of the many parades that happen every day at Magic Kingdom going on. We did stop for a minute or two to watch it before we headed to the back of the park for Enchanted Tales with Belle. We just made our Fastpass time (thank goodness for the 15 minute grace period they give you)! Guys, I’m telling you – if you have a younger child, you absolutely have to go to this one. It is one of the most precious experiences. Basically, the kids get to act out the story of Beauty and the Beast for Belle, then get to have their picture taken with her and meet her at the end. I would do a Fastpass for it if you can, but the lines aren’t ridiculously long for it. Such a cute experience! After that, we used a couple of snack credits on a Cinnamon Roll and LeFou’s Brew at Gaston’s Tavern next door. This makes a great Disney breakfast or snack if you need something quick to eat…one of my favorite uses of snack credits at Magic Kingdom! The three of us split the cinnamon roll for breakfast, so yes, it is as big as it looks. After that, we headed to The Barnstormer. This is one I had to sit out, so Noah and Emmie rode. This probably ended up being her favorite ride of the whole trip! I didn’t really know what to expect with her and roller coasters, but she just loved the less intense ones. I think she rode this 5 times total in the whole trip. Then, we rode Under the Sea: Journey of the Little Mermaid (it’s a cute ride, but not one I’d wait a super long time for). 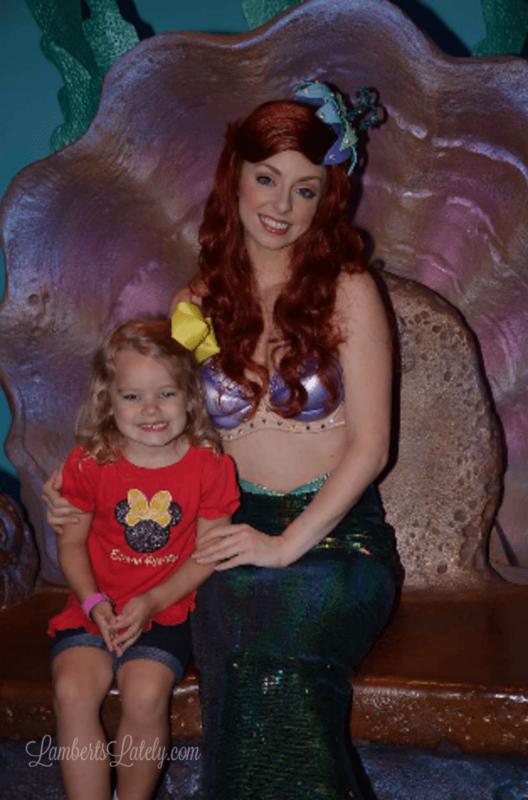 And then we had Fastpasses to meet Emmie’s favorite – Ariel! The lines can get longer to meet her, but I also saw some shorter waits too, so this isn’t necessarily one you have to use a Fastpass on. 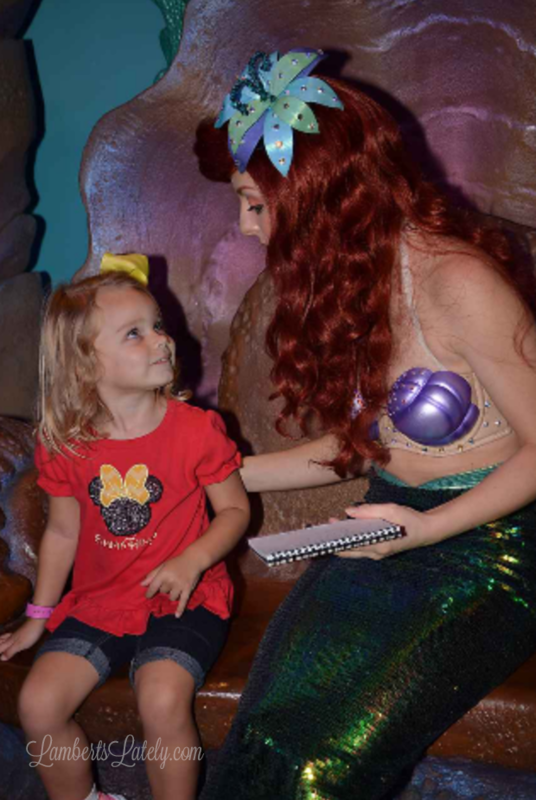 Ariel really took her time and talked to Emmie…she was so starstruck. It was adorable! We grabbed lunch at Casey’s Corner (it was ok – not one I’d go out of my way to get again, but good for a quick lunch). One good thing to note is that they offer a huge bag of cotton candy as a dessert option…definitely enough to share and save for later! 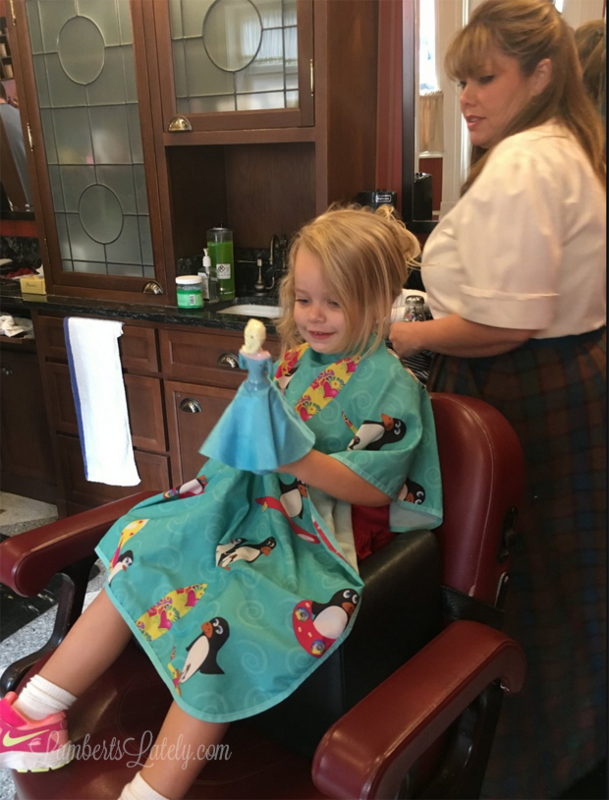 After lunch, we had an appointment for one of the things I’ve looked forward to the most in this trip…Emmie’s first haircut! Harmony Barber Shop on Main Street offers a “My First Haircut” package. You get special mouse ears, a certificate, and a keepsake of first hair in the package. It was so fun and super special…I’d highly recommend it, but make sure you make reservations well in advance, it books up quickly! She requested pig tails and fairy dust for her “style” after the cut! She did such a good job and loved the experience! Noah grabbed Pecos Bill’s for his lunch (he hates hot dogs, so he waited until later when we had lunch). This is a good quick service option in the Magic Kingdom – almost like a Chipotle/Qdoba, with fresher burrito options and a toppings bar. Plus the Churros you get for dessert are awesome! While Noah ate, we had a pretty good view of the Festival of Fantasy parade. We were in a little outside seating area across from Pecos Bill’s. Emmie’s cousin Avery (and her brother and parents, of course) were able to meet us for the afternoon! They live close, so they have annual passes and can make a day trip out of Disney. The girls hit up It’s a Small World first. This was another one of the repeat rides at Magic Kingdom…just a classic ride that usually doesn’t have ridiculous wait times. 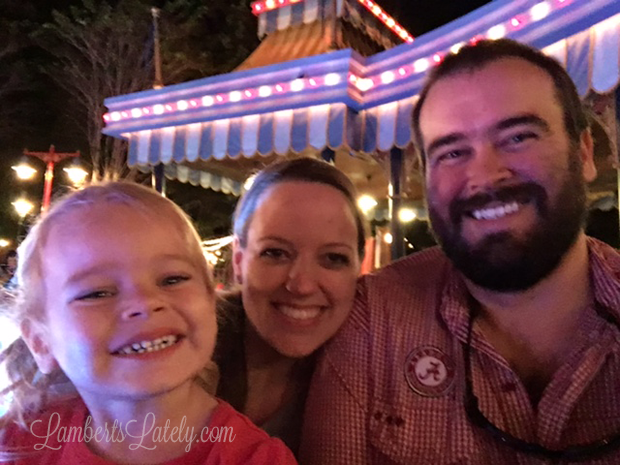 Dumbo was really cute and was definitely a repeat ride for the trip…Emmie loved going up and down! We also met Daisy and Minnie while we were in this area of the park! I wasn’t super concerned about meeting most of the characters in the parks because I knew we’d meet the big ones at our character meals, but this is a cute one (it’s Pete’s Silly Sideshow, right next to Barnstormer and Dumbo). Minnie and Daisy are dressed in carnival-themed outfits and the lines aren’t too bad. Plus, the whole family got to get a picture with the girls! We wrapped up our night shortly after the family left. 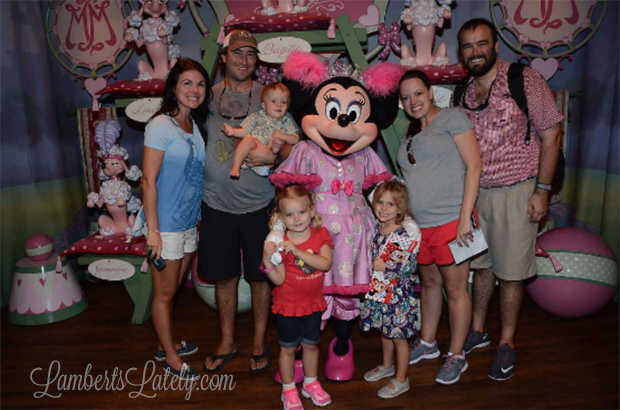 We had a busy day at Epcot the next day…I’ll be back later this week with the next installment! 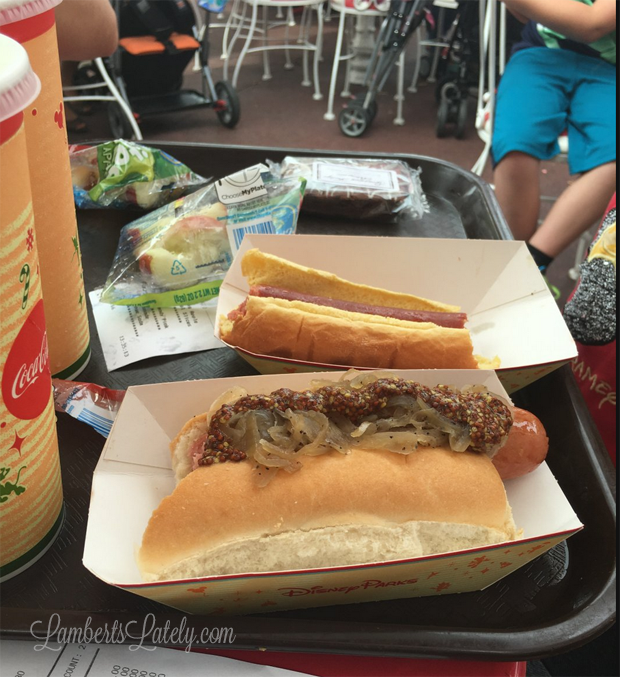 If you missed my other Disney World Posts, you can find them here!